Christian DeGraaf: Darn Hot Pepprers, LLC Habanero salsa! 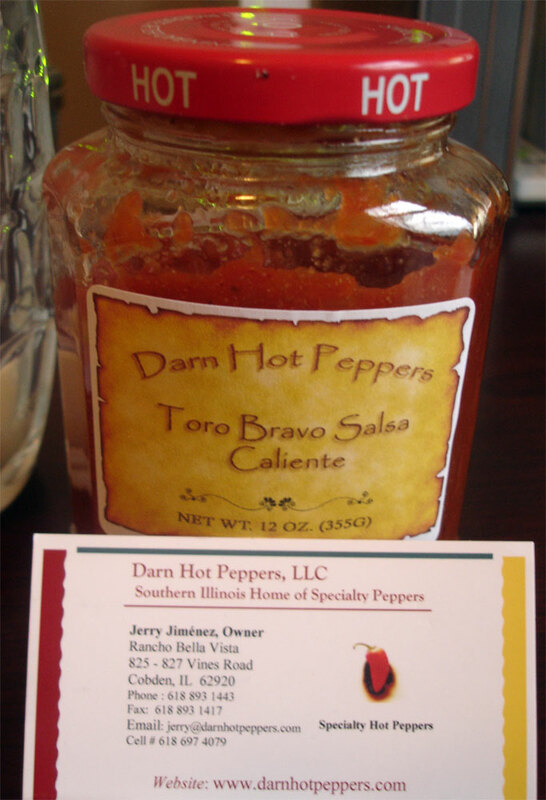 Darn Hot Pepprers, LLC Habanero salsa! The wife and I went to the Family Food Expo, which was a the UIC building, downtown. Lots of organic foods, raw food info and other good for you stuff. I found a both from Darn Hot Peppers, of southern Illinois that made salsa, spreads and spices. I tried their hot salsa which is made with habaneros and it was delicious. I also tried, really liked, and bought some of the honey habanero spread and also a full spice container of his 100% pure habanero spice. Jerry Jimenez is the owner and we really nice and I can tell, excited about what he makes. I really enjoyed his both and food. He's having a pepper feat this summer, which I may have to attend. Were glad you enjoyed the show, don't forget to check out our website and blog, at www.darnhotpeppers.com, for some great recipes on how to use your salsa.